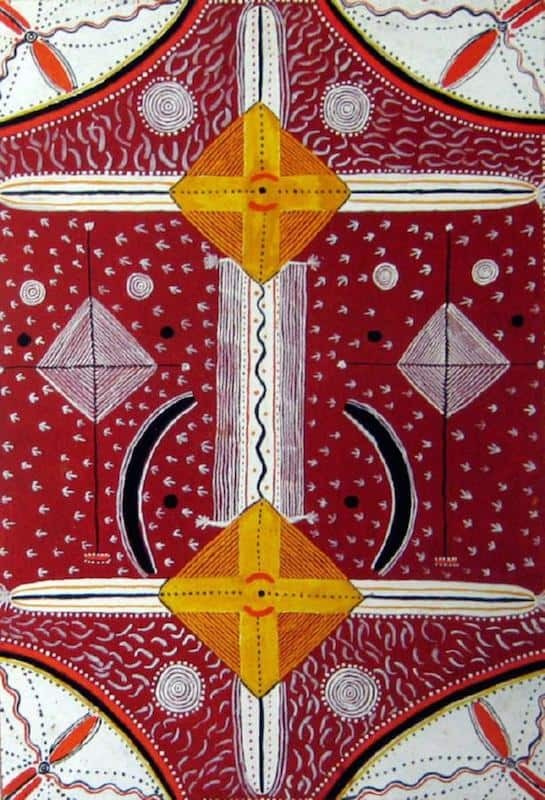 Kaapa Mbijana Tjampitjinpa was one of the major artists to paint a famous mural on Papunya schools walls. 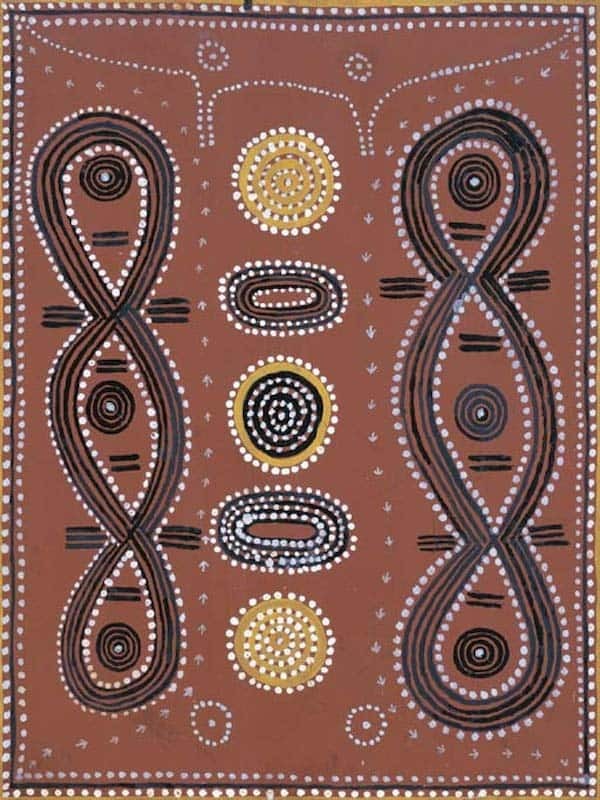 It is this mural that most people believe started the western desert Aboriginal art movement. 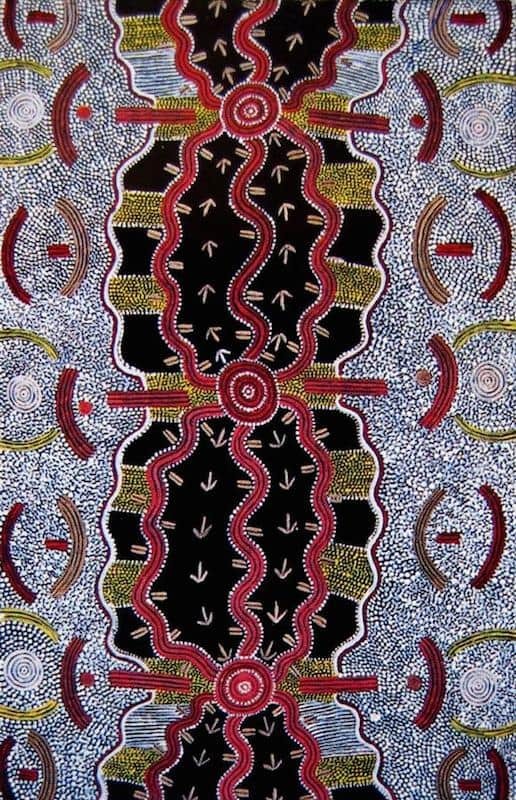 The aim of this article is to assist readers in identifying if their Aboriginal painting is by Kaapa Mbijana Tjampitjinpa. It compares examples of his work. It also gives some background to the life of this fascinating artist. 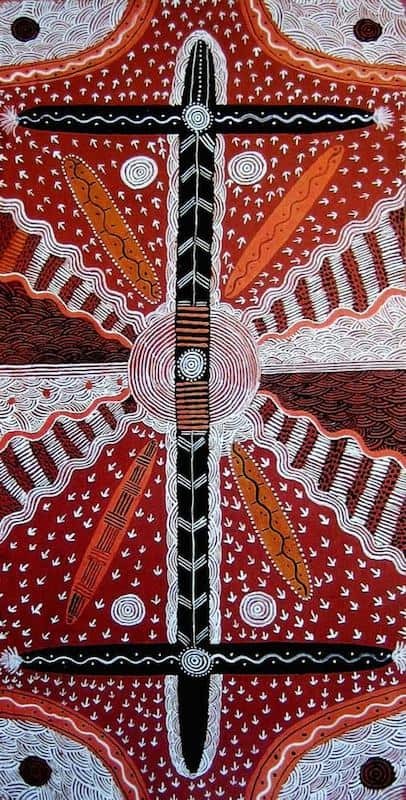 If you have a Kaapa Mbijana Tjampitjinpa Aboriginal painting to sell please contact me. 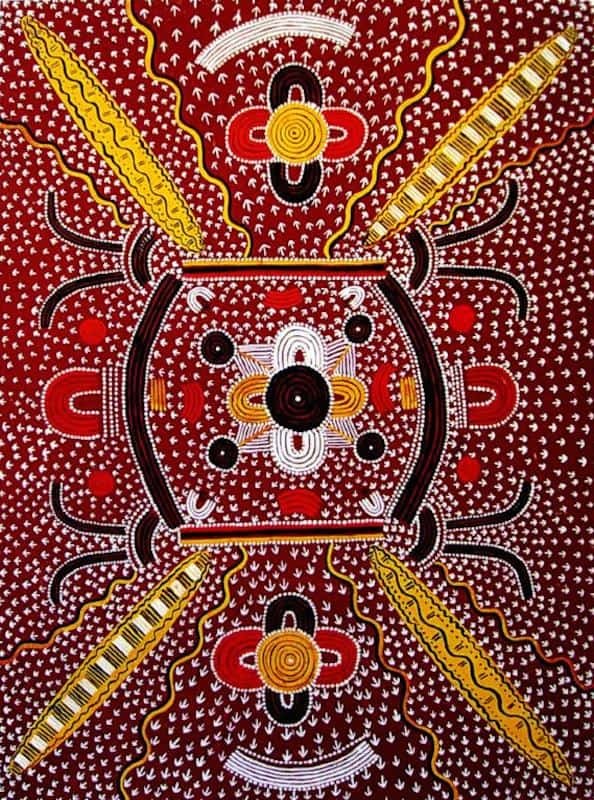 If you want to know what your Kaapa Mbijana Tjampitjinpa painting is worth please feel free to send me a Jpeg. I would love to see it. Kaapa Mbijana Tjampitjinpa was born west of Napperby at the Emu Dreaming site of Altijir in the 1920’s. Kaapa’s clans country was around Warlurkulangu, the ancestral bushfire site in Warlpiri country. Kaapa Mbijana Tjampitjinpa underwent full initiation at Napperby.As a young man, he became a stockman like Timmy Leurah, Clifford Possum, and Billy Stockman. 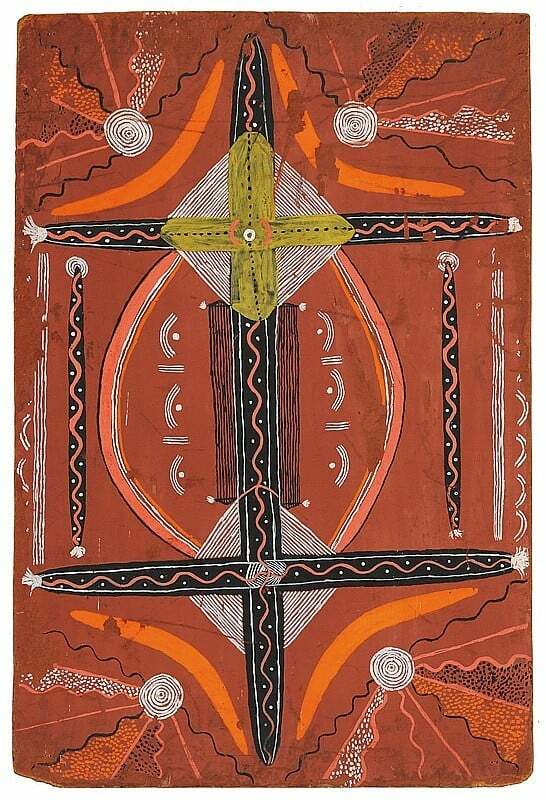 Kaapa Mbijana early paintings show designs and motifs painted on a plain black or orange ochre background. Some paintings include realistic figures finely decorated with body paint. Early works often depict ceremonial objects such as shields, spears, and ceremonial boards. 1972 was also a prolific year for him. A spate of sales followed his winning the Alice Springs Caltex Golden Jubilee Art Award. The jubilant painting group decided to start their own artists business. They elected Kaapa Mbijana Tjampitjinpa as founding chairman of Papunya Tula Artists. Kaapa died in Alice Springs in 1989. 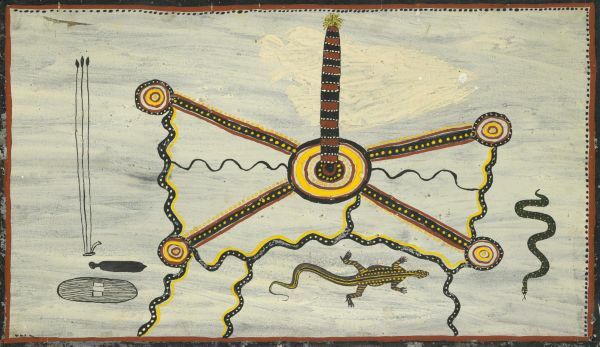 His art though endures and are held in major collections throughout Australia and overseas. Like so many great artists his influence and artworks persist long after his death. Kaapa Mbijana Tjampitjinpa has variations on his skin name so it can be spelled Kaapa Mbijana Jampijinpa, Kaapa Mbijana Djambidjimpa or Kaapa Mbijana Tjambitjimba. Kaapa is also sometimes spelled Karpa and Mbijana spelled Mbitjana Mbitjani,or Mbijani.